I can hardly believe it is November already. Amazing really. I know it is cliche to say "time flies" but it truly does. 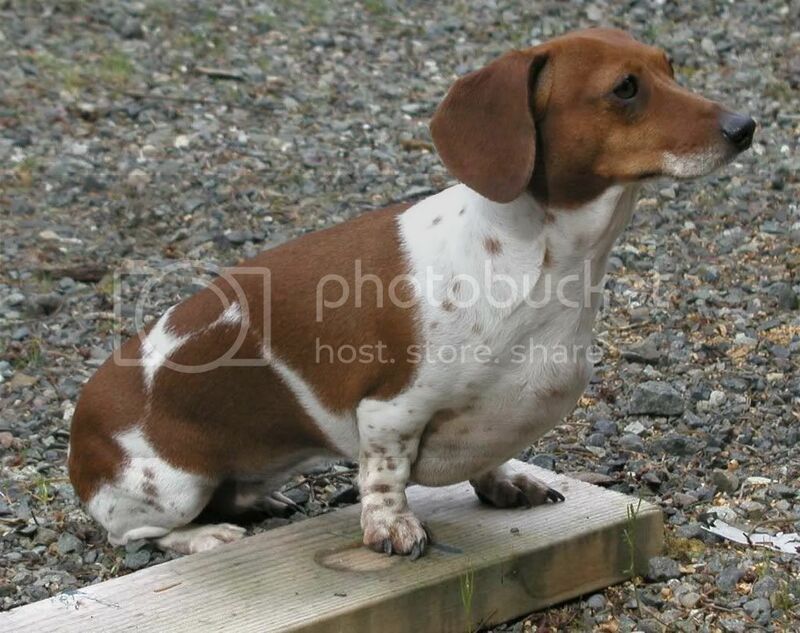 Thanks for all the help on arranging my pictures so they will click big. I think I've conquered it! (Candace you are very patient) I've been blogging nearly a year now so you'd think I'd have realized before now that most of my pictures wouldn't enlarge. 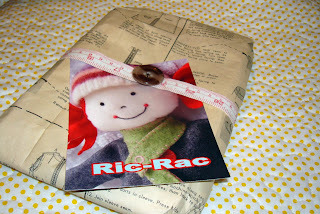 Do you remember I won Jodie's giveaway at her Ric Rac blog when she posted that amazing selvedge dress a few weeks ago? Well, the prize arrived over the weekend. Look how cute Jodie had it wrapped up. Well, here is my prize! A beautiful selvedge scarf. It is so pretty and it is lined in velvet. I can't imagine anything it wouldn't go with. I was very excited when I opened the package. Jodie kept it a secret what the actual prize would be but I knew it would be made with selvedge. It is just in time for cooler weather. And speaking of Jodie, go see that sweet fabric teacup she has made. It is so cute. I love the shape of a teacup. Thank you so much Jodie for the darling scarf. I can't wait to wear it. 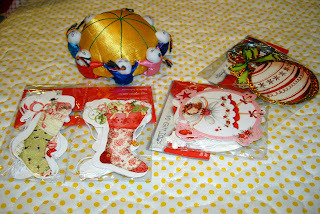 The very same day Jodie's prize arrived from Australia I got another package from Australia with Lily, Carolann and Cate's Christmas Cottage blocks. Lily's blog Block-a-Day is one of my favorites. She makes such great things. 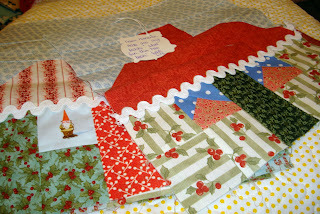 Look at the cute pincushion and Christmas tags she included in her package. Thank you so much Lily! They are darling. Here are Lily's blocks. Look at the gnome and the curtains in the windows. They are really fun. Here are Cate's blocks. Her fabric and trim are fabulous. Here are Carolann's blocks. 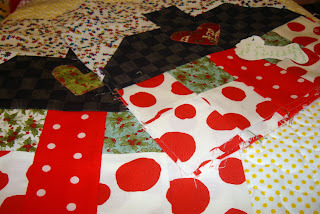 I love the big big dots and she's appliqued a cute heart on the roof! Thank you girls. I love all of them. It is so fun to have more international cottages in our exchange. Here are Tara's blocks. Tara lives in my area. Her blocks turned out so great. I wish this picture were better. I'm so glad she joined our exchange. The little snowman in the window is so sweet. Mel's blocks arrived as well. 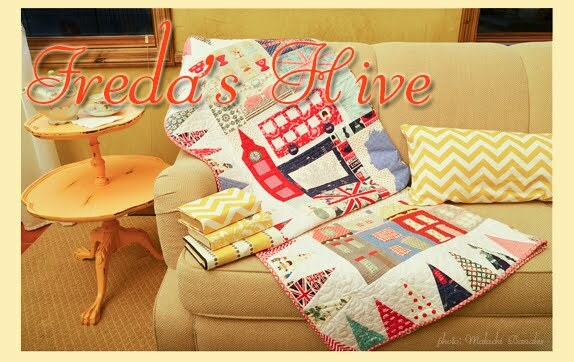 We all know what her blocks look like from her wonderful cottage open house on her blog. They are sewn perfectly and her fabric and trim are adorable. Mel has made a Dear Jane quilt so you know what her technique is like. 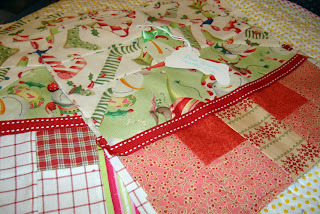 I've been working on gifts and fun things this weekend in addition to working on my strawberry quilt. 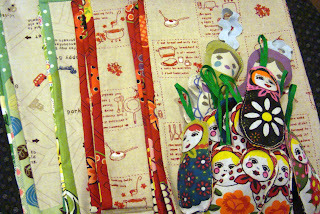 I fussy cut matryoshkas and filled them with lavender to make sachets with a little rick rack or green trim loop on which to hang them. My family thought I was making Christmas ornaments. They would look cute on a tree but I think I would want to fill them with pine scent of some sort. I've also been making kitchen towels from some of my linen/cotton blend Japanese fabrics. I love how they turned out with the fabric binding. I machine stitched the binding instead of hand stitching the back like I would for a quilt and it turned out pretty well. I stitched in the ditch on the front and it caught the binding on the back. And now that you can click my pictures for a close-up you can see it was a success. You'd think I wouldn't be still making Christmas cottages wouldn't you? Here are my latest above. I think I've made more than 40 now. Some of them are trimmed in this green cotton Christmas braid. It has bees on it (you've got to click the picture - I got the trim on Etsy and I love it). This week Terri and I will mail the cottages off to our exchange participants. There are only a few left to arrive and then we can divide them up and send them out. 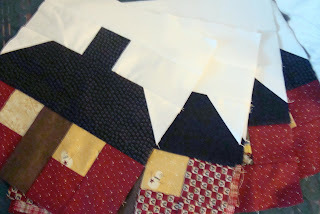 I've think I've decided how I'm going to arrange my cottage blocks for my quilt. When I get started on it I'll show you, of course. Ooh, that scarf is amazing! What a great idea -- and how luxurious with the velvet! Those cottages are looking fantastic! Belated Happy Birthday to Shelbie - love your scarf - still love all the cottages - I didn't know there were Aussie girls in the swap - boo! hoo! I missed out. Love that scarf..now I'm wishing I had not thrown out all those selvedges! Wow! I love the selvedge scarf...that's a wonderful prize! And your dishtowels are almost too cute to use! (But of course, now I want to make some). And more cute cottages! I'm definitely waiting to see how you put yours together before I put mine together...are you going to use sashing? Love the scarf. Congrats on your win. The little houses are too cute. I like the polka dotted sky on a couple of them. You are so lucky, that selvage scarf is beautiful!! And oh my the cottages are overflowing and lovely!! Ooooo and aaaaaaaaah...the scarf is gorgeous! Lots of wonderful cottages in your groups. Always great projects happening in your Hive. I CAN NOT wait to get the cottages in the mail! My goodness! What adorable stuff. Love all of the cottages, and the matryoshkas are adorable. Lucky you for winning the scarf. It's great. I love your kitchen towels!!! 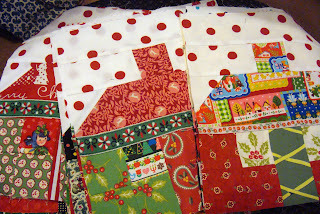 Fun fun fun blocks and projects - those Christmas blocks, with their different trims and fabrics and fun peeps (and I use that word loosely, LOL!) in the windows - it must be like Christmas for you every time you get a parcel in the mail to open! Qhat a neat idea for the scarf and it is really stunning. I never would have thought to sace the selvages before now. 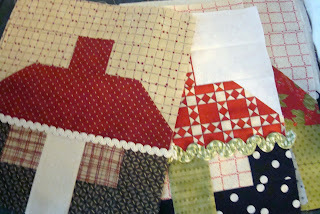 I posted today about the cottages even though I did not participate in the block swap. (I found out too late!) but I did put together something really neat with your tutorial! Please go and see it!! Yay, Nanette, I think you've got it! 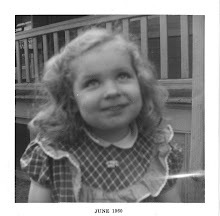 Congrats on getting all of your pics to enlarge - I knew you could do it! Oh, and the matryoshkas - my husband loves them - we both have eastern European heritage - and adore these (and babka, pierogi's, kugelas, etc)! The cottages just continue to amaze me....great post! Cheers! Happy late Birthday to your DD from Texas...what a lovely "treat" for that Halloween! That scarf is awesome. Looks like you are having fun at your house. So much going on. Aww.. the scarf is very pretty! And the cottages are sooo cute!! Lucky ducky!! I love that scarf!! I'm getting so excited for my cottages and think that ALL of them are adorable!! Thanks again for sharing your great inspirations! Oh my goodness Nanette! I love that selvage scarf!!! I'm so inspired! What a great prize!! Lovely cottages and your Matrouskas are sooo cute too! What wonderful presents and blocks. I used to save the selvages from fabrics but never knen what to do with them. This is a great idea. 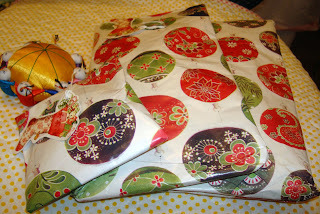 What a clever and cute way to wrap a package.. with an old pattern piece like that. And before I entered the Land of Blog.. I never heard of anyone doing something with selveges! That scarf is totally amazing. Can't wait for the block exchange.. it is really getting exciting! So Many Pretty Things to Love, *karendianne. Oh the scarf is just beautiful, what a great idea. I also now can see what i can do with my fabric from japan. i got more today and will post after I vote! That scarf is amazing! All the cottages are wonderful, as always. I know I will miss seeing them when your exchange is over. 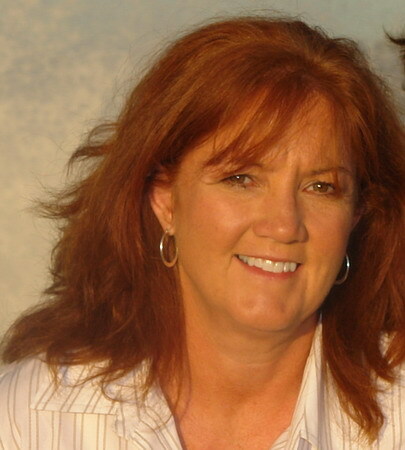 I love what you've been creating, too - you're such a talented lady, Nanette! Thanks for sharing! Yay! 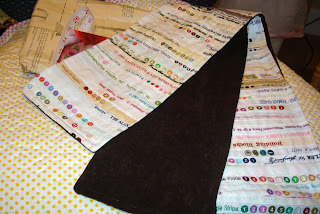 I was just wishing I could enlarge those pictures of your quilt group quilts! 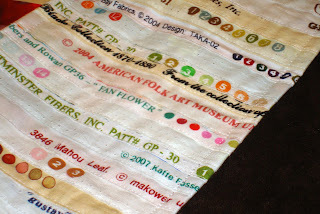 I love those selvage quilts--I have a huge tub just waiting for me to get going! Those cottages coming in are just so cute! !